Brunton Funeral Directors is situated in Leven and run by Neil and Nyree Brunton, who are both local to the area. At Brunton Funeral Directors we provide a caring and professional service to communities in Leven, Lundin Links, Largo, Kennoway, Methil & Buckhaven, Wemyss and surrounding areas. A Funeral Director is on call 24 hours a day, 365 days a year, including Christmas Day. For funeral arrangements, please call at any time, day or night. You do not have to wait until the death certificate is issued to call. We will help and guide you every step of the way. 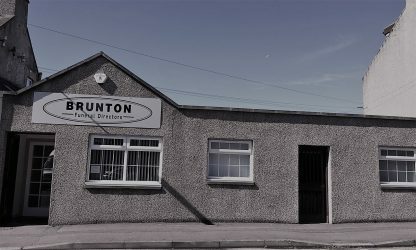 Brunton’s, previously named John Mitchell Funeral Director, is a long-standing business of over 40 years, family owned and run, with experienced staff who can provide a quality and well-organised service in a friendly and dignified way. Neil Brunton is a Scales Award Winner – the top student graduating in the UK – with over 15 years experience in the funeral industry. He worked for many years with John and Thea Mitchell until their retirement when their daughter Nyree Brunton joined the business full time. Please do not hesitate to call with any query; those seeking quotes are most welcome. We also provide a simple funeral for families who wish to apply for a Fife Council Funeral Expenses Payment. Pre-payment plans are available, brochures on request. From when we receive your call, to the day of the funeral and beyond, help and guidance throughout the whole process will be provided. You have the right to choose the Funeral Director you wish.